Something different at this years market than years before, is that the market is taking place in the evening! I’m personally excited because this most likely means we won’t have to battle 100 degree temps! This also brings forth a new challenge in that it will be dark for most of the market and because of the large amount of you wonderful vendors, plugging into the city outlets is not a option. But take heart! This means we get to use some creative juices and we’ve done a bit of research for you! We went out last Friday night and checked out what DOMO’s First Friday vendors do for lighting at their monthly markets! After walking the market and street and talking with a few of the vendors, we think we have some great ideas for you! One of the vendors had a wonderfully bright booth using only 3 of these great battery powered LED lights from Home Depot with a few twinkle lights sprinkled throughout for ambiance. These lights are at Home Deopt in the back corner of their lighting department! 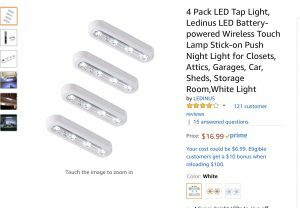 They are $20 a piece, but they are magnetic and rechargeable and have 3 different levels of brightness! 2-3 of these bright beauties plus some battery powered twinkle lights would light up your booth perfectly! 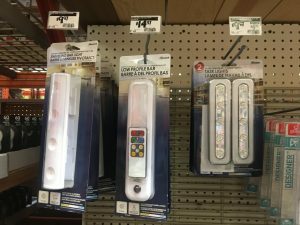 Here are a couple other battery options we found while at Home Depot! 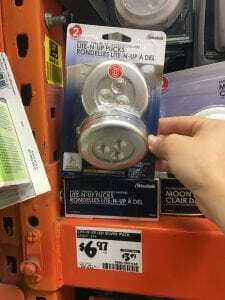 These battery light pucks would work if you put them on the ceiling of your easy up in the corners and middle bars facing down! They had a few different LED light bars to choose from though after testing a couple of them, the ones listed above were the brightest, though a couple dollars more. 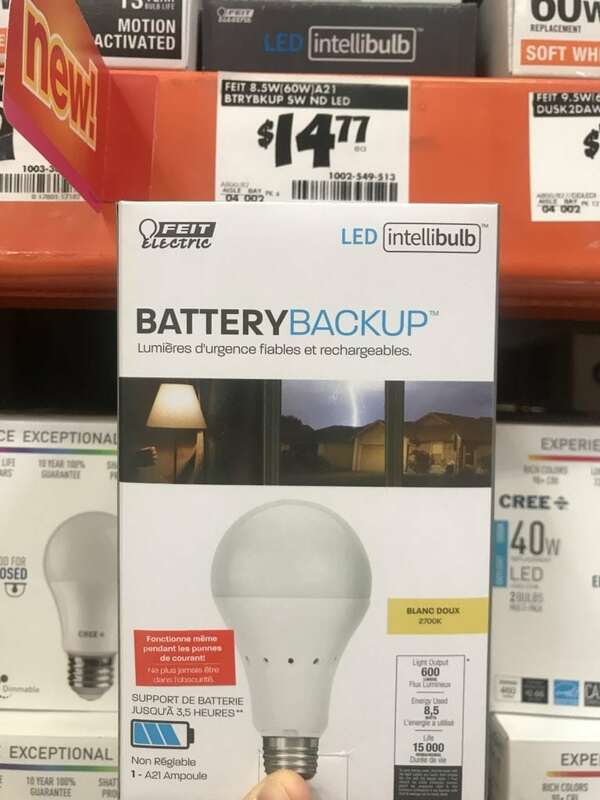 Another fun option we found at Home Depot were these battery back up light bulbs for $15! They would allow you to use any table lamp for a cozy feel in your booth! The box says they run for 4 hours on one set of batteries and are reusable! 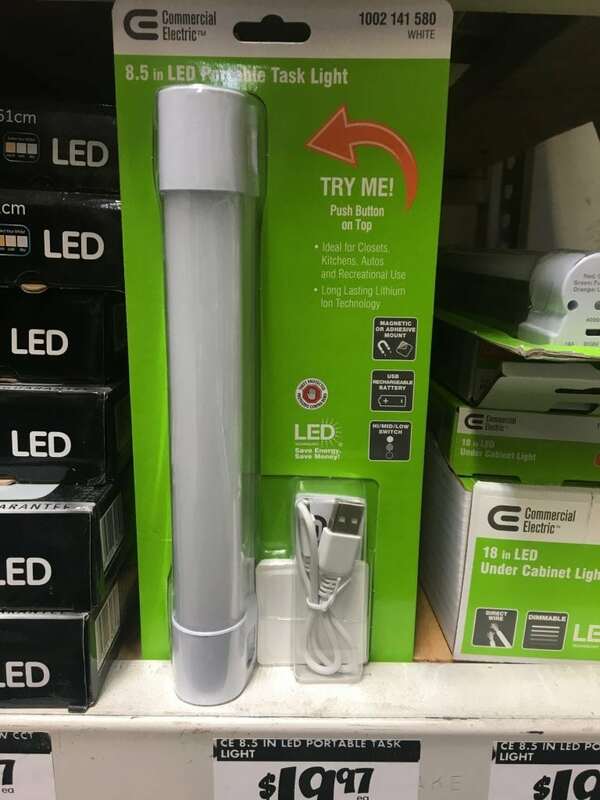 (I would test them with the lamp of your choice before hand) Located in the light bulb section of the store! 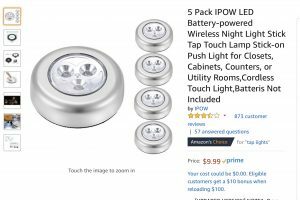 Here are some great options we found on Amazon! Click the photos to purchase! 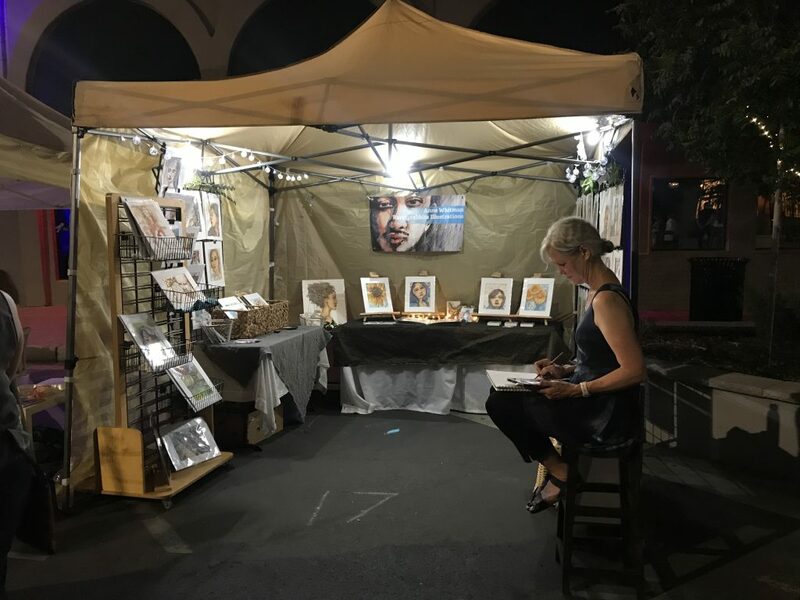 I hope these ideas help you figure out an easy and inexpensive way to light up your product and booth the night of the market! 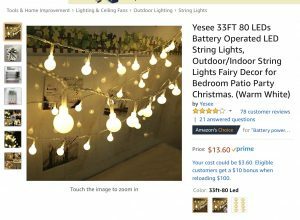 We highly suggest the light bar first listed with twinkle lights for ambience but we know you vendors are creative and will come up with some great ideas! If you still have some lighting questions, please shoot us an email and we will help you out as best as we can! This One’s for the Vendors! This one is for you vendors! With the market just a few weeks away, we want to make sure you are equipped with resources to make it a successful one! When running a small business, being social media smart is the best way to go! But don’t become overwhelmed by the overabundance of options or scared if you are not familiar with technology! Here are a few simple tips to help make the most of your social media presence. I suggest starting with these two, becoming familiar with how to navigate and use them and then you can branch out from there! Remember to make your username the same and easy to read on each account! Nothing is more frustrating than trying to find a business online only to find that it’s listed under a completely different name! Facebook and Instagram are amazing for building a community around your business and get people talking about your services! Here is a FREE ONLINE COURSE created by local business Hill Media Group on how to create and manage a Facebook page for your Business! Instead of bombarding the internet with 50 product photos all at once, spread it out and share the love! Posting a couple times a day, every day is much better than all at once. And don’t rely just on product photos! Share posts about who you are, why you do what you do and why you are passionate about it! Here is a simple list of daily posting ideas from Social Media Marketing Blogger Rebecca Coleman! Social Media is all about the visual draw! The pictures you post online will be a person’s first impression of your business and you want them to be eye catching! It doesn’t matter how amazing your product is offline, if you post dark, unfocused or too busy photos, people won’t stay around long enough for a second chance. With today’s phone technology, you don’t even beed a fancy camera! Just remember that bright natural light and simple backgrounds are best! Here are a couple resources that offer simple and great ways to take creative and professional looking photos! Hashtags are like the new version of searching Google, especially on Instagram! If someone is scrolling photos on Instagram and wants to see ones specific to farm house decor, they will most likely type #Farmhousedecor #Farmhousestyle #rustichome ect…and if your photos featuring your farm house decor products don’t include theses, your photos won’t show up, and you’re out of the running. But you also don’t want to go overboard with using ones that aren’t even related to your business. Here is another great course on the right way to use Hashtags to promote your business! Social Media is all about creating community and that requires that you reach out and start the conversation! You will not stay relevant, gain followers or increase your business presence if you’re not building online relationships with fellow creatives online! Another great resource for Market prep is over the at The Nerd Burgers! 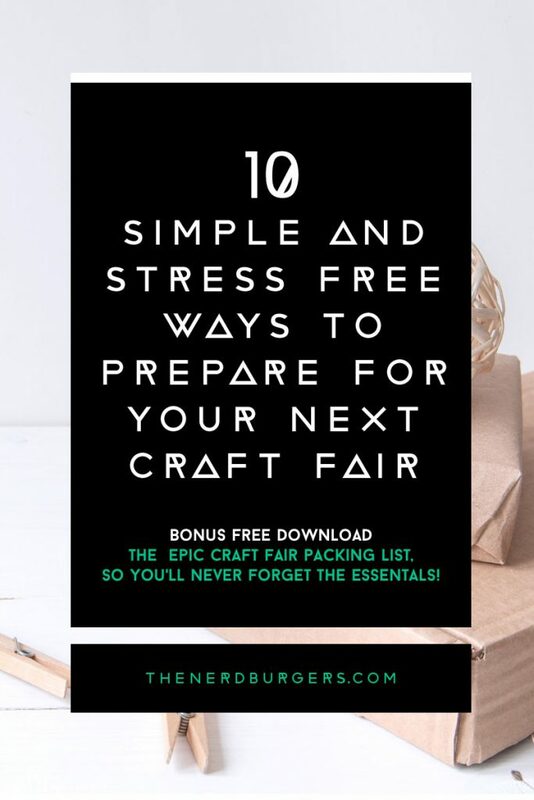 They put together a whole course (10 Simple & Stress Free Ways to Prep for Your Next Craft Fair) plus some great free printables, like a prep calendar and supply lists for the day of the market! Hello Vendors! We are about 3 weeks away from our market and hopefully you are well on your way to a beautifully stocked booth! I will be setting up my trial booth in my living room next week to make sure everything has a thoughtfully planned place! The tip today is for that wonderful moment when someone decides they want to take one of your treasures home! They’ve chosen their purchase, you’ve handled the transaction…now what? Nothing drags down the professional feel of your booth than throwing their item into a plastic grocery bag with no thought or care. You worked hard on your booth the past few months, and most likely they paid good money for your item, you want to finish the transaction between you snf your customer flawlessly and beautifully. But don’t panic. This doesn’t have to be complicated, more work or expensive! I absolutely love plain paper craft bags for wrapping up my purchases! They come in many sizes and colors and designs! I have found great prices on Amazon (click picture below), Ebay and sometimes even the DollarStore! Hobby Lobby has a great selection of sizes, and you can wait for their weekly sales or use a 40% off coupon! If you find yourself with extra time and energy 🙂 you can always decorate the bags, add your logo or even pre tie some ribbon to the handles; make the bag fit your business style! For my booth, I sell a lot of breakables and throwing them into a bag, even a nice one 🙂 doesn’t work. I have the added step of wrapping my items in tissue paper. But fear not, the Dollar Tree has tons….for a $1! I will definitely be loading up on a bunch! This is a simple step to making your booth, your business, your passion more beautiful and professional! The Four Friends Market isn’t a garage sale, flea market or thrift store where grocery bags or plastic bags work! We are a market striving to help you succeed as a small business! The Four Friends are so excited by the amount of small business owners who have chosen to be a part of our market this year. We want your experience to be the absolute BEST that it can be. One of the ways we want you to be pleased is with how well your sales go. So many factors play into this aspect and you all have one down- your products/items are amazing! However, there are more details that can help your business flourish and increase your sales and we want to share some with you. When I read this article from Dear Hand Made Life, I found it so helpful that I wanted to share it with you all. Enjoy! Vendor Tip: Don’t Forget the Holidays! We are now less than two months away from our market! (insert cheer!) And if you are anything like myself (Mallory), you’re starting to look at your inventory and take note of what you still need to find, make or dream up. I just wanted to send a reminder that this market is perfectly timed to target the buyer’s holiday wish lists! Not only is Christmas fast approaching, but throw in Thanksgiving and New Year’s, we have some amazing holidays to prepare for. As a vendor, this is an amazing opportunity to showcase and display your holiday items! Make our guests feel like their Christmas decorations won’t be complete without your amazing wreath, fragrance candle, or happy jingle wood sign! Don’t forget the cute fall themed accessories, pumpkin decor or the much needed new New Years Eve necklace! Now, don’t freak out that you have to completely restock your booth with holiday goodness! Just a touch will do! For my booth, I will have these (and more) Vintage Shiny Brite ornaments on display, but holidays won’t be the main theme of my booth. Can’t wait to accomplish some Christmas shopping with you all!